Link to the first and second map. The starting point was supposed to be El Sainete, but it had to be relocated as we found out that they were on weekly rest -fortunately before getting there-. 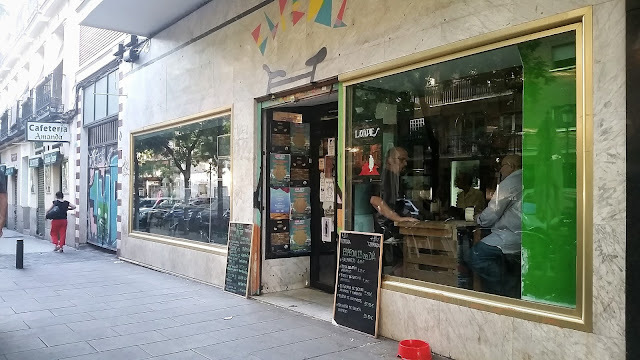 Thus, the first visit was a recent incorporation to the Madrid scene, that had premiered just the day before: Craft Against the Machine, the new venture by the guys at La Tienda de la Cerveza, a popular shop and meeting point for many beer lovers in Madrid. Beyond a classic colourful façade of tiles, in which one can read 'Salón de Peluquería' -old-fashioned Spanish for hairdresser-, there is a small and inviting property, with white walls and bricks at some specific points, a small bar on the entrance and a few tables to sit. When ordering my Mad Brewing BBC Cascade, a nice and fresh Pale Ale with oats, I was also served a tapa of kartoffeln salad that I gratefully ate. A good time, and a very good impression that I took from this authentic neighbourhood bar, with a categorically local offer in its 6 taps. Who would guess what hides beyond the precious façade of Craft Against the Machine. Next stop just beside the always busy Plaza de Lavapiés, where there is a beer bar that could go unnoticed if it were not for a lantern with Schneider stickers, given that the old façade remains -almost- as it was before its opening. On the contrary, the inside of Chinaski Lavapiés exudes character, with a striking style on the way between a comic and a graffiti. The property has the bar and several tables where to sit, as well as a sufficiently large space where some events are scheduled from time to time. Surely the part most shared in social networks is its colourful board, which announces the beers coming out of the 18 taps available at the bar, with local references and also some classics for traditional palates. I wanted to try something by gypsy brewers Titan Brewing, from Zaragoza, so I decided to order their 4.5% ABV Session IPA, Hellhound. The popular beer board at Chinaski. A few meters away, El Pedal was awaiting us. A true classic nowadays, being the first craft beer bar in Embajadores. And the only for several years. It is a very simple place: small dimensions and walls with colourful illustrations, but with the greatness of having a lovely terrace in the outdoor area, with several tables to sit and enjoy. In addition to the 10 beer taps, they serve vermouth and wine, and have an attractive supply of beer bottles in the fridge, at a range of prices to suit all pockets. Apart from swallowing nuts, which were cheerfully received at this point of the evening, since they had their own beer I did not hesitate to ask for one of the house offerings, Pedal Ale. Elaborated in Yakka, Murcia, it is a fresh and fruity Pale Ale, with a certain malty profile, and a residual yeast touch. El Pedal's façade, as seen from the terrace. 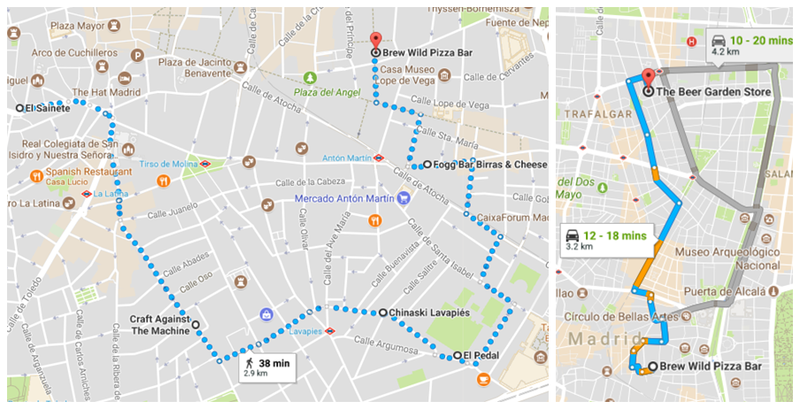 I was looking forward to the next bar, because I went there without success not long ago, on a loose night that I stayed in Madrid -my fault, for not checking the schedules-, and it had been strongly recommended. Fogg Bar Birras & Cheese, already in the neighborhood of Cortes, is a long property, with a large bar where to sit and some tables near it, as well as in the back of the place. 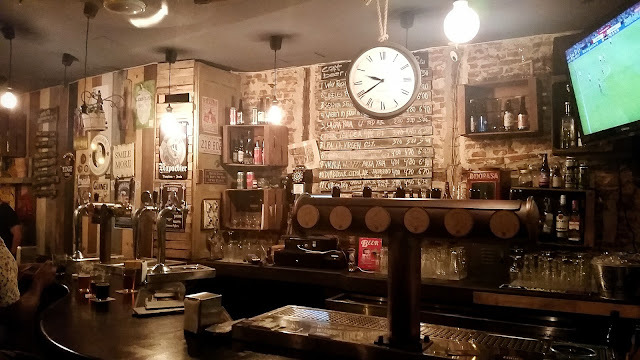 Dim lighted, it wins your heart with ease thanks to its combination of wood and brick, which combined with beer-related decoration and an endless amount of bottles make the site frankly pleasant. 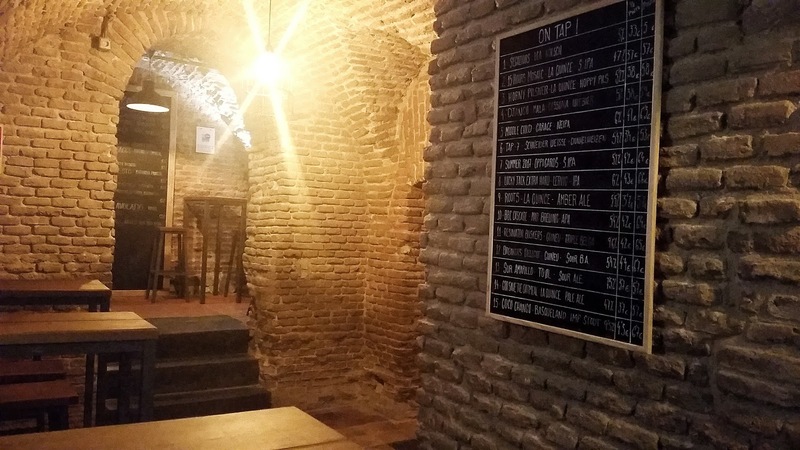 Famous and acclaimed for its cheese and sausage boards, it has 11 taps, 3 of which are fixed for the classic craft brands of the Meseta: Cibeles, La Virgen -AB-InBev- and Sagra -Molson Coors-. Very nice and with very good food, like the mini-frankfurts that they gave us with our drinks. 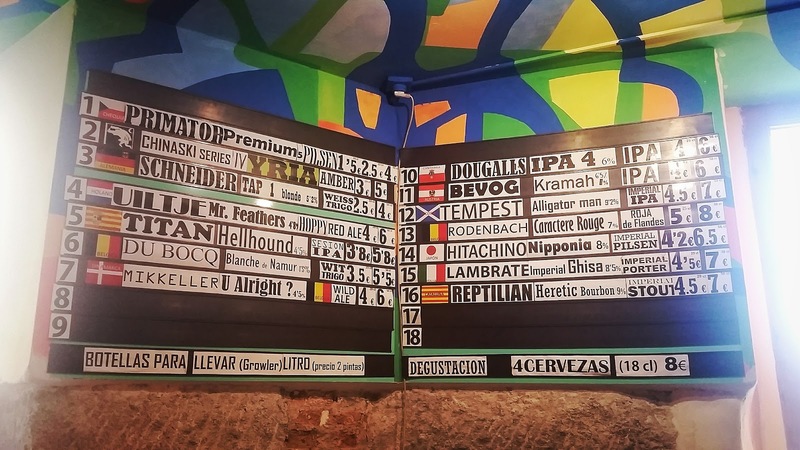 In my case, I had a Culture Trip by Garage Beer Co, out of curiosity to try their beers outside of Barcelona, now that they have grown beyond the brewpub. So cozy. The bar at Fogg, ideal for a long night session. After nibbling, it was high time for dinner. The place, again, was planned in advance: an unavoidable choice not only for its good offer, but also for being on the road with one of its founders. Very recently opened, Brew Wild Pizza Bar is a joint venture between gypsy brewers La Quince, one of the city's flagship stores -and probably on my personal top 3- Labirratorium, and the instagrammer Carlos BeerXposer. Its approach? It seems so obvious, so emphatically normal, that one wonders how nobody had thought of it before: pizza plus good beer. Starting with a fantastic Horny Pils, I masterfully accompanied the delicious bacon and onion pizza with Roots, an Amber Ale by La Quince, as it was the first beer. The main floor presents a modern craft beer bar aspect, but the underground floor hides a sublime space: an old brick cellar, perfect for dining, or to organise events. I was left astonished. Simply spectacular. The spectacular cellar at Brew Wild Pizza Bar. We decided to make one last stop, for which we could have been walking a long time to reach it. But in order to ensure enough quality time on the premises we used Cabify, which provided us with a perfect, fair priced fare. 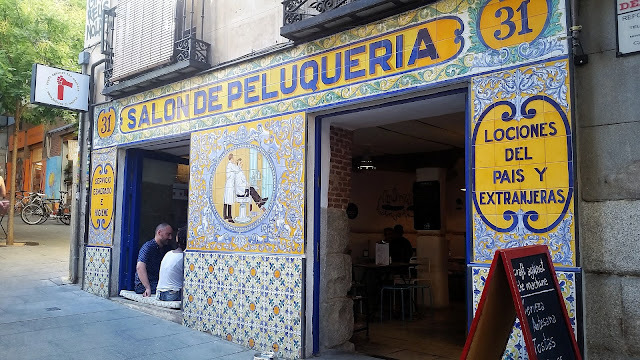 On Calle Juan de Austria -Chamberí- we found The Beer Garden, formerly a shop a few meters from the current space, which is without a doubt the place with more personality in Madrid. In his element, Guille Roiz rewards all visitors with his courteous personality across from the bar, becoming an excellent guest of a bar that feels more like the dining room of his house. But in the 60s. 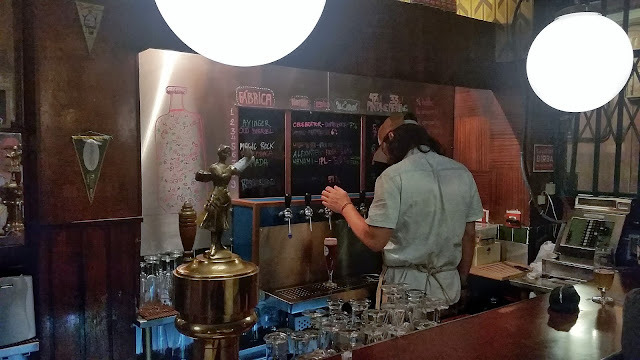 With a decoration that is the ultimate expression of randomness, the property has some room around the bar -9 taps- and a cozy loft with tables, as well as a storehouse below where the keg cooling chamber is. I drank Beersel Framboise on draft, and then shared a 2013 bottle of Boon Vat 77 from the house's reserve. I don't think I can stress enough how essential it is to visit this place. And with the sweetest taste in my mouth -or should I say sourest?-, after visiting such good places to drink beer, some of them undoubtedly called to set the trend and be the leaders of a beer paradigm shift in the city, the day came to an end. 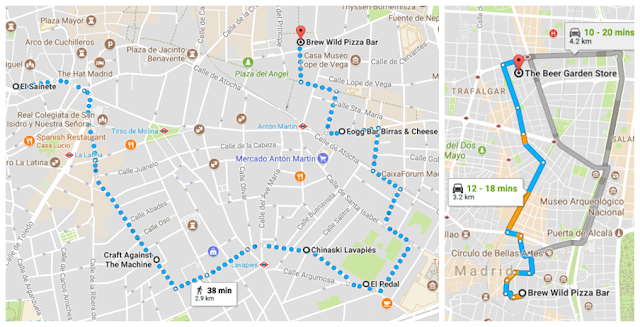 I had already covered a very good part of the places I wanted to visit, and in the subway on the way to the hotel I reread and complemented the brief notes in my notebook with satisfaction, while remembering the experience of each of the two routes followed so far. But before finishing my trip, there were a couple of additional visits without which I was not planning to move away from Madrid.